There are two ways in which you can launch a 2D or 3D Viewer in Visual MODFLOW Flex: From the Main Menu or from the Data Explorer. 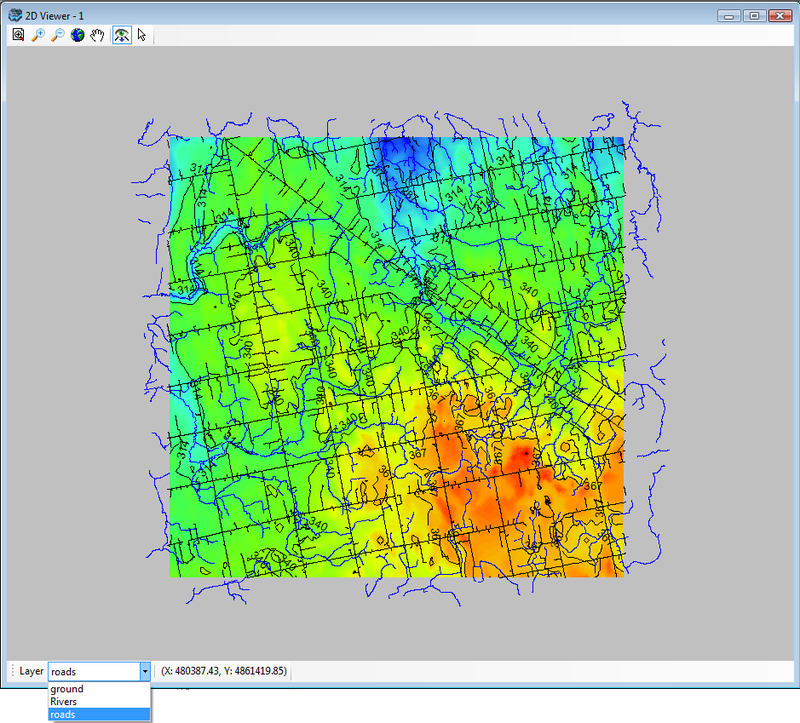 •From the Data or Model Explorer, right-click on a data object and select 2D Viewer or 3D Viewer from the pop-up menu. A new viewer will then launch, displaying the selected data object. Please note that the viewers listed in the pop-up menu depend on which data object is selected (see table under "Displaying Data in Viewers"). To display data in a viewer, select the check box beside the data object in the Data Explorer or Conceptual Model Explorer. If multiple viewers are opened, the data will be shown in the active viewer. 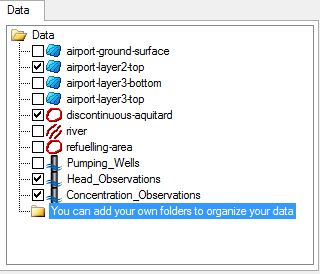 To remove data from a viewer, select the check box beside the data object so that it appears empty or “unchecked”. When a data object is displayed in a viewer, it will appear as defined in the data object settings. For more information on viewing and modifying data object settings, please see Data Settings. Layer ordering in 2D Viewer is determined by the sequence in which data objects are added to the viewer. For example, if two data objects completely overlap each other, the data object added last will appear on top of the other. You can bring layers to the top, by using the Layer combo box, located at the bottom of the 2D Viewer window. The Layer combo box contains all of the layers currently displayed in the 2D Viewer. Select a layer from the combo box to bring it to “the top” of the layer order.